Your wilderness tour includes an incredible scenic flight from Anchorage to Wildman Lake Lodge. You will travel southwest by comfortable twin engine aircraft through Lake Clark and Katmai National Parks, along the volcano-studded Alaska Peninsula Wildlife Refuge, viewing wildlife and exploring the wonders of the remote Alaska Peninsula. Photograph glaciers, volcanos and miles of untouched wilderness along the way, then down the Bering Sea coastline, all before reaching Wildman Lake Lodge. Here in Alaska;s true wilderness Brown Bear, Pacific Walrus and Wolves are our closest neighbors, while moose, caribou, fox and many more wild species flourish all around us and the bird species are too numerous to count. 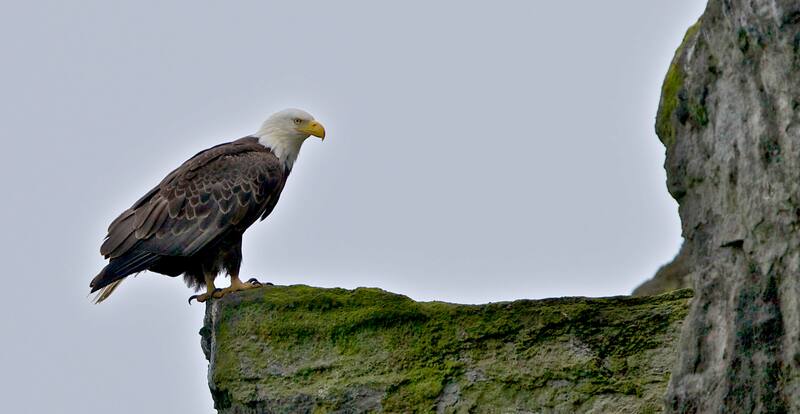 Guided Photo Safaris to view and photograph Alaska’s most wild creatures in their natural habitat. Like no where else on the planet, the Alaska Peninsula is truly, in the Wild! Join the experienced Alaska Bush Pilots and Wilderness Guides at Wildman Lake Lodge for a wildlife viewing experience that you will never forget, and return to the warmth and comfort of our deluxe wilderness lodge each evening. 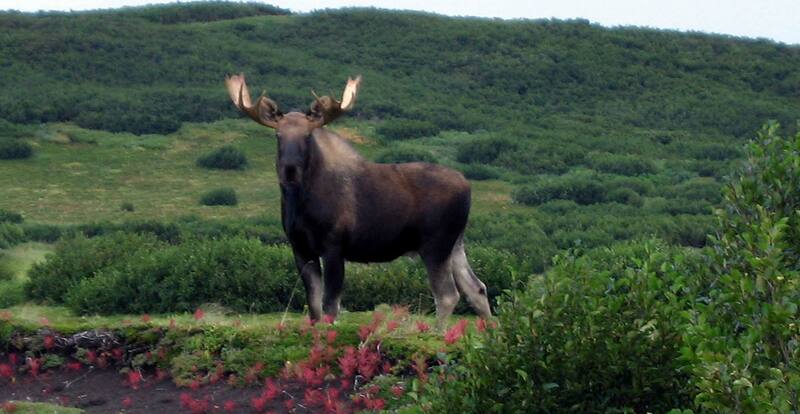 Nowhere else in Alaska will you find real unhabituated wild animals roaming as they did a century ago. This is not a canned tourist attraction, this is an EXCLUSIVE Alaska Wildlife Tour and Photo Safari, guided by real Alaskans on the remote Alaska Peninsula. If you want to see more bears than people, don’t go to a National Park! Visit Wildman Lake Lodge, where the bears never see people, and neither will you. don't go to a National Park! Visit Wildman Lake Lodge, where the bears never see people, and neither will you. The Alaska Peninsula stretches from the mainland to the Aleutian Islands and is renown for its abundant and diverse wildlife populations. Daily sightings include huge Alaska Brown Bear, Barren Ground Caribou, Arctic Wolves, the ever-curious Red Fox, majestic Bald Eagles and a variety of other raptors. During your week at Wildman Lake Lodge you will surely see Alaskan Moose, playful River Otters, Seals, Walrus, Whales, Tundra Swan, and countless ducks and geese including the rare Emperor Goose, only found in western Alaska. Pacific Walrus (Odobenus romarus divergens) are the largest of the of the Pinnipeds “fin footed” family of marine mammals. In Alaska, the Pacific walrus’ range includes the Chukchi and Bering Seas. Wildman Lake Lodge is located where the Bering and Bristol Bay come together and several thousand adult male or Bull Walrus arrive in our area each spring. After spending the entire summer with us, these huge (2,000 to 4,000 pound) bull walrus migrate northward in October to join the rest of the walrus herd in the St. Lawrence Island region for the winter months and breeding season which occurs in January and February. After the calving season in late April and early may, great herds of huge bull walrus return once again to our area to summer. 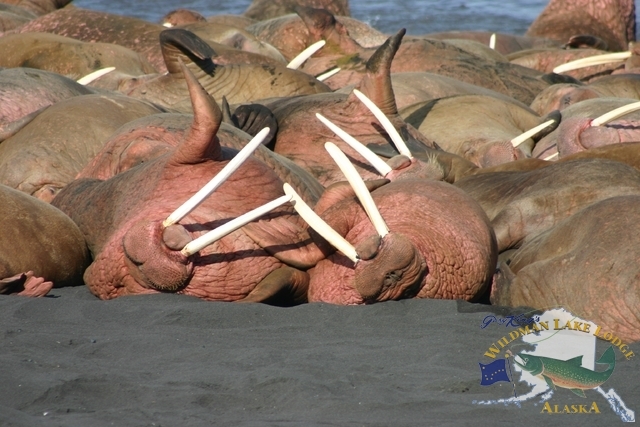 Only 10 miles from Wildman Lake Lodge is one of the Bering Sea’s most frequented Pacific Walrus haul-outs. This is a special resting location for Bull Walrus an is just an 8 minute flight in our lodge aircraft. Experienced bush pilots will land you right on the black sand beach, walking distance from a rocky lookout just above the walrus. 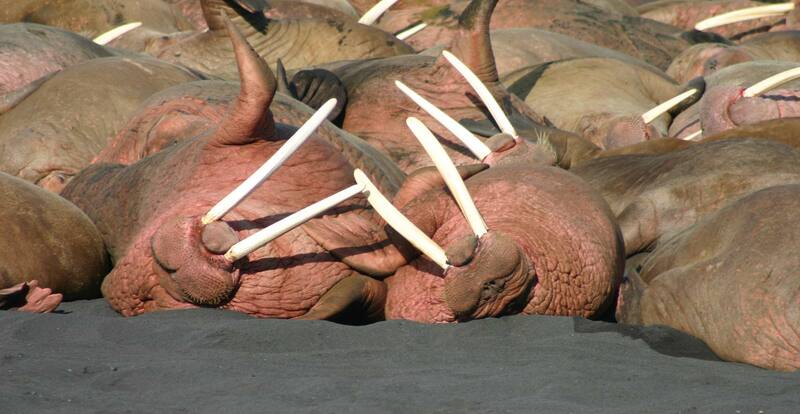 Here we generally see anywhere from 300 to 3,000 Pacific Walrus on any given day. This is as close and personal to wild walrus as it gets, and a once in a lifetime experience. Return to the comfort of our deluxe wilderness lodge each evening. Our guide-naturalist will explain the unique life cycle of the Pacific Walrus. Be sure to bring your best camera or video, as we will stay as long as you like since it is only a short flight back to Wildman Lake Lodge. Wildman Lake Lodge is better located and equipped to get you where the walrus live than anyone in Alaska. Alaska Brown Bear On the Alaska Peninsula the Brown Bear is king! The Alaska Peninsula has one of the highest population density of Alaska Brown Bear in the world. There are hundreds of bear in our area and casual sightings of brown bear along our fishing streams are every day occurrences. 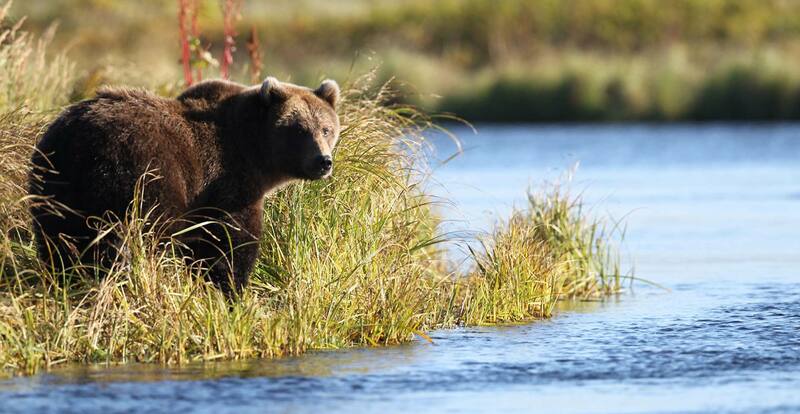 The brown bear population in our area is well-nourished by the millions of Pacific salmon that return each year to the Alaska Peninsula rivers. Quite often we sight brown bear right from the lodge. Nearly every day you can photograph them feeding on Ocean River near the lodge. Brown bear are relentless beachcombers and can often be seen along the black sand beaches of the Bering and Pacific coasts, as well as fishing for salmon along our numerous pristine rivers. We take every opportunity show our guests the brown bears as Wildman Lake Lodge is one of the best places to view real wild Alaska brown bear, totally undisturbed, in their most natural habitat. At Wildman Lake Lodge, you never know when a photo opportunity will present itself. The sheer abundance of wildlife is absolutely astounding. From the smallest ground squirrel to enormous Alaska brown bear, colorful spawning salmon to breaching Pacific whales, huge Alaska moose, barren ground caribou, Arctic wolves, red fox and more. Explore the black sand beaches of the Aleutian coastline and search for artifacts, antique glass fishing floats, fossils and whale bones. Visit Alaska’s newest discovery, an ancient Alutiiq Village near Wildman Lake. Whether you are a professional or an amateur, you will want to have your camera ready.